TJ Heavy Duty Header Bar Kit for Jeep Wrangler TJ 1997-2006. The Heavy Duty Header Bar Kit is a highly recommended addition to the Trail Cage installation. The Trail Cage can be installed with the Stock header bars, but those are little more than thin-wall tubing intended to brace the windshield, providing little in the way of cage protection. Our Heavy Duty Header Bar Kit replaces them with precision-manufactured, high strength components that work with your Stock roll bar and Poison Spyder Trail Cage Kit to provide the strength and safety of a real deal, heavy duty cage. The Heavy Duty Header Bars are made from high strength 1.75 inch x .120 wall DOM structural tubing, laser Notched and expertly welded to CNC laser cut 3/16 inch mount plates. 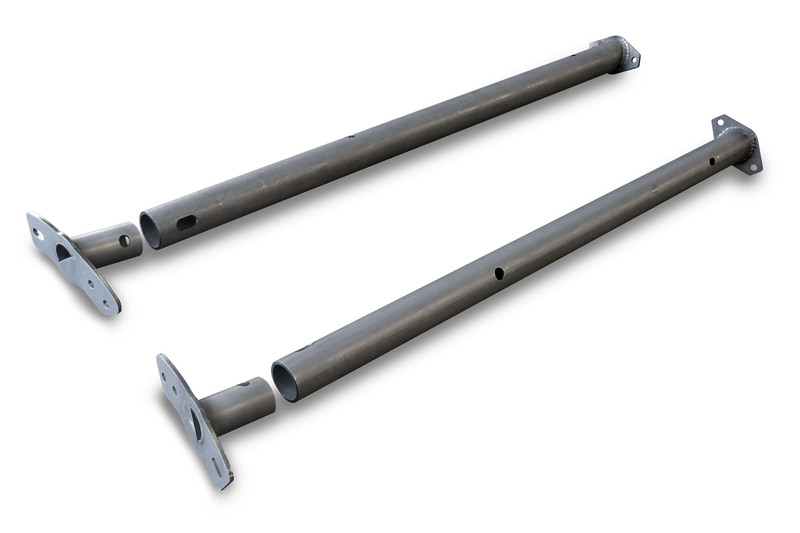 For comparison, the Stock header bars are made of .095 wall welded seam tubing, with thin gauge stamped metal mounting flanges. The DOM tubing used in the Poison Spyder kit has a yield strength of 70,000 psi, with a tensile strength of 44,668 lbs. Compare that to the welded seam tubing of the Stock header bars, at 40,0000 psi yield strength and only 19,757 lbs. tensile strength. The Heavy Duty Header Bar Kit may also be installed by itself without the Trail Cage, or with other manufacturers add-on cage kits. A Torx T-50 Tamper-Proof Driver Bit may be required to remove and replace/reinstall the OE windshield spreader bars. These may be hard to find at your local hardware store, so they are available from Poison Spyder for your convenience.